A friend at work recommended Helen Russell’s The Year of Living Danishly after I recently visited Copenhagen. This book was the autobiographical tale of a well-off writer and her husband moving from London to rural Denmark, after the latter was offered a job at Lego headquarters. The stories of their experiences were mixed in with some light journalistic investigation as to why Danish people are so often reported to be among the happiest in the world. Russell’s writing was engaging but light, which made this book fun, but maybe less insightful than it could have been. Nonetheless, it was a pleasant, easy read. 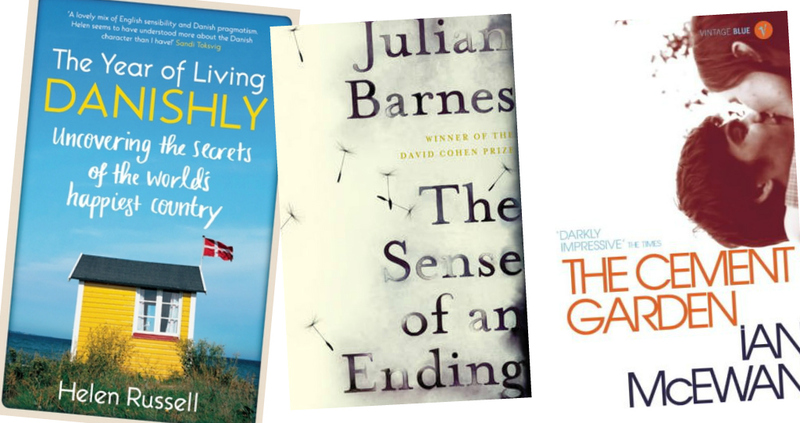 Julian Barnes’s The Sense of an Ending has recently been turned into a film, which – guess what? – I haven’t seen. I found it to be a beautifully written book, which explored ageing and the flaws in memory. So many passages of this book were quotable that it read like poetry. I think that if the ‘revelations’ at the end of the book had been a little more mundane, then the wider observations about the reliability of memory and the incompleteness of the picture anyone holds in mind at any given time would have hit harder. But who am I to argue with a Booker winner? Ian McEwan’s The Cement Garden was a deeply creepy book about four children hiding their mother’s corpse to avoid being taken into foster care, and then attempting to live independently. The plot was grotesque, but less so than the twisted, psychologically charged atmosphere McEwan built. I understand that this has also been turned into a film that I haven’t seen… Whatever. I found it brilliantly disturbing. This 2,318th post was filed under: What I've Been Reading.